When it comes to explaining away this winter’s weird weather pattern, with snow on the ground in 49 states and strangeness all around, there’s no one root cause. Instead, the lead forecaster at Columbia University’s International Research Institute for Climate and Society, Tony Barnston, has pointed out two phenomena as the root cause for this winter’s strange weather patterns. The unholy tag team of La Nina and the North Atlantic Oscillation are sending weather patterns into full-on freak out mode. Normally, La Nina results in warmer, drier weather conditions for the Southeastern US and warmer, wetter conditions in Asia and Australia, as well as in the Pacific Northwest of the United States. However, thanks to the work of the more powerful North Atlantic Oscillation, rather than getting warmer and drier, we’re getting ice-cold and moist due to the North Atlantic Oscillation being in its negative phase and bringing down the frozen northern thunder (while leaving Canada and the normally cold parts of the world with relatively mild temperatures). 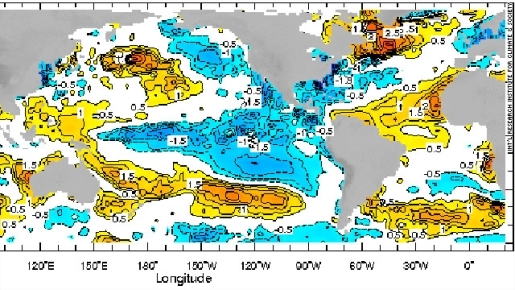 According to Barnston, “the North Atlantic Oscillation has superseded the La Niña” at the moment, but if the Oscillation shifts from negative to positive, temperatures will return to normal and we can expect a warmer, milder winter for the rest of the season.